Lately, I’ve been having difficulty trying to figure out how to make the best decision for many things. I turn to digital technology to get the help I need from my friends and colleagues on a multitude of things. It’s easy to get things done quickly online and get the feedback you need from your tribe. I rely on the Internet for help. Someone will have the answer I need and I am always happy to provide the answer for them when they ask. As a kid, I was told I was to fear the Internet and it was not a great place to be in. However, I disagree because I feel it’s a place where I can get reliable and honest feedback. I also can find good software and advice and most of the time it’s free. The only thing I need to pay for is an Internet connection. What are the most mind-blowing facts about airplanes? What tweak has made all the difference in your life? What was the strangest thing you have experienced as a foreigner/visitor in the United States? What is the cheapest thing you’ve seen a mega-rich person do? There are many more, but I believe you get the point that people have some awesome stories to tell where you can get some great information because people are willing to share their stories on this platform. Why do people live in Albuquerque? What is the Public Transit system in Albuquerque, New Mexico, like? Why are technical writers introverts? Seriously, if you know why technical writers are introverts, I encourage you to answer it! I enjoy having Quora around for this reason. According to Rheingold, we “collaborate publicly without requiring or expecting any direct reward” (p. 155). Quora will curate questions and answered based on my preferences, so I can enjoy reading people’s answers which I deem worthy and I get to upvote or downvote their answer based on my thoughts. Above all, I’m here to learn on this social network and have an open mind about anything because I see the human condition written by others who are like me. 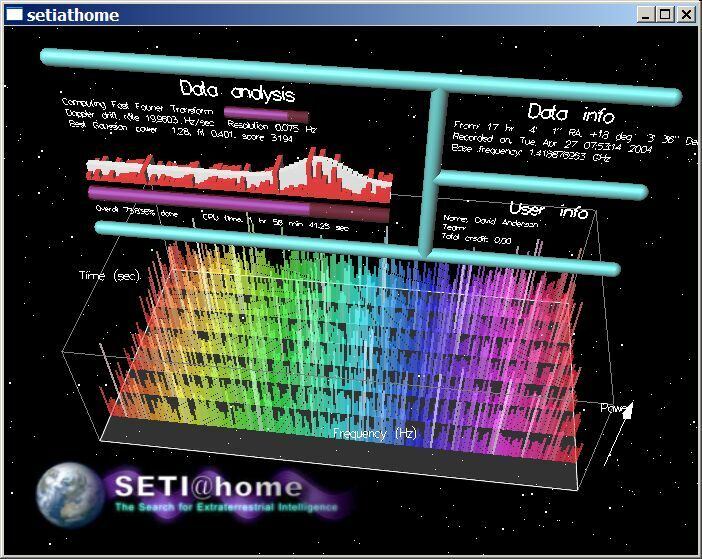 My first participation in crowdsourcing was downloading and installing SETI@Home. I would help crunch data in exchange for a pretty screensaver. Yes, I know it would eat up processing resources and electrical power, but I felt I was doing something helpful running the program and looking at my units that I completed. Rheingold noted that I was part of a group of people who would donate time and computing power for “mass collaboration in response to” science (p. 168). It’s a feel-good thing where I could directly help “scientists understand the universe or assisting biomedical researchers who are seeking to cure a disease…” (p. 169). SETI@home Classic screenshot from Berkeley. One thing I missed was the Folding@home project where I could have helped in another way. By that time, I didn’t have the time and I moved on to using a laptop instead of a desktop and it would not be helpful for me to overheat my laptop. But that doesn’t mean I didn’t stop helping whenever I could on the Internet. Occasionally I’d fix a problem a problem with grammar on Wikipedia, update a listing on Google Maps, or edit a manual on iFixIt. I love these kinds of websites because I’m invited to edit content to make it better. I actually enjoy the moment I can make a change on Wikipedia, which is kind of like a nice thing. At work, our content management system works in a similar fashion, except we have a few administrators (me and my co-workers) who approve content updates. What makes my job awesome is that I get to make those edits to the content updates before we get to click the publish button every time. Whenever I think of a social network that is helpful, it is my group of colleagues who are spread out across the world who know about technical communication and content strategy. Whenever I need help with a tool or understanding about a new concept, I can send them a message on any of the social networks I’m connected with. In a sense, Rheingold calls this a PLN, which is a “personally curated network of people I want to learn from and a network that learns together” (p. 228). What I try to do is maintain my network all of the time by following people I am interested in, ask questions whenever I can, and feed my network by providing answers. Somehow doing this for several years with my colleagues I’ve met at the Society for Technical Communication Annual Summits have earned me a place in the field. This year, I’ve presented a couple of times and am reviewing session proposals for the 2017 Summit. On the otherhand, I also have gained a couple of side gigs at another conference. So far, maintaining and building that network online has taken me to places like Las Vegas, Portland, New Orleans, and Dublin. In fact, without this network I would not have had the opportunity to attend this class. I certainly attribute and appreciate these connections for giving opportunities at the right time. I have tried to return the favor by helping out with the Society for Technical Communication whenever I can. I want to mention that Rheingold’s last chapter is a great summary of the book. In fact, during my conference I have had the opportunity to talk with a lot of colleagues about the books I’ve been reading in this class and a couple were considering to add them into their future reading lists. Let’s see where it goes from here! I may now have a new hobby to find books that are interesting that my colleagues would be interested in. No, I will not create a technical communicators book reading club (but I probably will). what (we) consumers want…” (Slide 4). One of the best things that has come to the world of consumer media is that I can get the media almost immediately instead of waiting for it to arrive. Movie date night with a girlfriend can be as easy as downloading a feature film in five minutes from Amazon.com. Lastly, I love how digital technologies are available on most devices. It’s not like I need to have a specific device to use my content. As long as I have a multi-use device, I can read, listen, or watch what I download. It’s not like the past where I need to buy a DVD player to play movies or a CD player to listen to music. However, I’m worried that our multi-use devices will become nostalgic. Tonight, I get to watch a movie on DVD, which required unpacking my DVD player from my box. Maybe next week for nostalgia-sale, I’ll find my VHS player stored at my parents, blow the dust off the VHS tapes and watch The Lion King. Posted on October 30, 2016, in Social Media. Bookmark the permalink. 4 Comments. Netlfix and Amazon Prime have spoiled me, but mainly for tv. I still enjoy going to the movie theatre. It’s difficult to watch a 23-episode season of Blacklist or How to Get Away with Murder when a new episode comes out each week. But being able to binge, even just a few at a time, helps me keep the narrative arc in my head. As for the PLN, I first discovered this, albeit not by the same name, in my first year of doctoral studies. Since my professor required us to blog, and this was back in 2003, it was very cool to be part of a small group of rhetoric and composition grad student bloggers. This prof pointed us to other profs who were assigning their students to blog about their graduate research, and that led to many professional development opportunities. We all still network on the screen, primarily through Twitter nowadays, and in person at conferences. I’ve not been on Quora but will definitely check it out. I always prefer hyperlocal resources because they come from authentic voices like yours. I wonder if you can turn your content mgt work into the topic for a final paper? Great discussion about the posts and your own experiences. I’ve heard people mention Quora before but did not know exactly what it was for. Those sorts of social media sites are really effective. I now find myself reaching for them more than ever now like Yelp and REX whenever I think about going to get a haircut or dying to try out a new Chinese place. I completely love the way crowdsourcing content has changed the way we think about learning. I am a huge fan of collaborative learning and shared knowledge. Professionally, it sounds like you have had great success with building and maintaining a tribe of people who can challenge and support you in your endeavors. Social media is viewed as such a narcissistic medium, but it also exposes up to professionals, personalities, and other figures we might never have come into contact with. It’s a necessary weapon in our technical communications toolkit. Thanks! I prefer reading interesting articles on Quora that I would otherwise never read. People aren’t getting paid to write on there, but you can see what people are up to. I think everyone has a story and this way anyone can participate and contribute! Being aware of the tools we have online is all that it takes to open the door to new opportunities. I definitely agree that I use the internet to get almost all of my information. Despite my aversion to technology for the most part, and even though it comes with its unique brand of migraine, it’s pretty amazing when it works and comes together fluidly. I depend on it throughout my everyday and talk to Google as if it were an old friend. I believe I’ve mentioned this anecdote in a previous post/comment from another week, but my mom has asked my sisters and I why we never call her for help. She told us that when she moved out on her own, got married, started having kids that she was on the phone with her mom multiple times a week asking for hints, advice, and tips on basically “how to adult”. We were like, “Mom, we just Google everything.” I remember the olden days when Ask Jeeves was the way to go, then Google decided to become, in my opinion, the best search engine ever. My husband and I are just scratching the surface in regards to starting our family (don’t worry I won’t get into too much detail), but it’s only been a few days since the conversation has come up and I’ve been on Google and Pinterest about a hundred times looking for information, answering questions, and discovering all sorts of terrifying testimonials that have absolutely given me second thoughts! I used to joke and say I got my Associate’s Degree from Google University. I was so clueless my first two years of college I had to Google everything. How to write a paper, who so and so was, etc. Google has had my back for years. I notice the same thing on Facebook. People often reach out and ask for help or advice from Facebook friends. My husband and his friends often have ongoing dialogues regarding which zero-turn lawnmower is best, different equipment, things like that. While I try not to depend on the internet for absolutely everything I find myself turning to it before anyone or anything else.